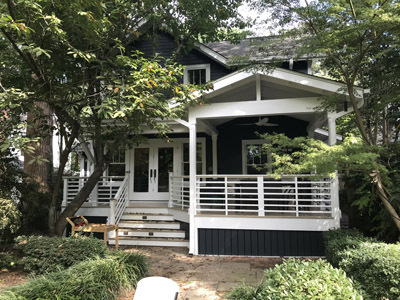 What is the benefit of working with Archadeck, a custom deck and porch builder in the Raleigh-Durham area? When you seek a builder for your new outdoor living space, you have several options. You may find a general carpenter or construction company for whom decks and porches are one of many types of structures they build. Or, you may find a company that builds decks and porches but mainly works with a set number of standard designs. As a custom outdoor living company, Archadeck is different. We are completely focused on designing and building decks, porches, and patios. All of our projects are specifically designed for each client and are completely unique from any other. When you build a custom outdoor living space with Archadeck, your project will be fully customized to meet your needs, to match your home, and to fit your budget. 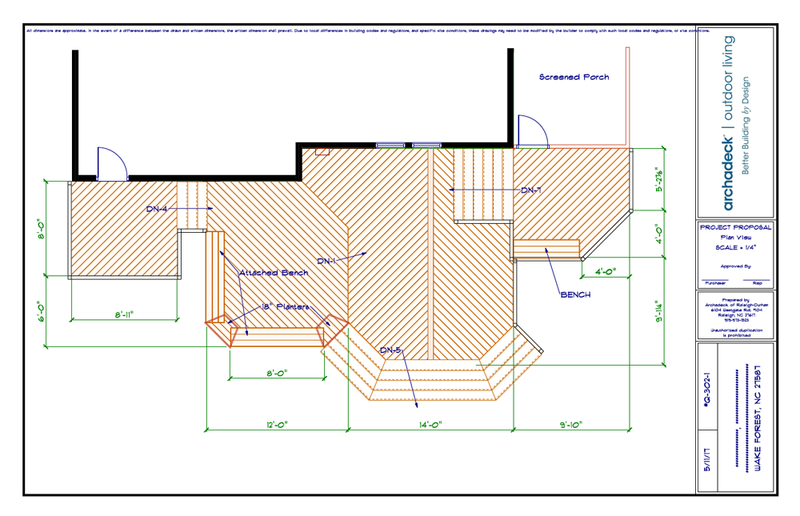 Your project will be built using the highest quality of materials and construction standards. At Archadeck of Raleigh-Durham and the Greater Triangle, we build your dreams with high-quality design and craftsmanship from the first sketch to the last nail, screw, or fastener. What Deck Design Decisions Will You Make? Archadeck of Raleigh-Durham guides all design decisions based on your preferences and the context of your home. Let’s look at some design considerations for building a custom outdoor living project that’s just right for your family. What determines the size and shape of your deck? Important considerations are how you plan to use the deck, the size, and shape of your home, your yard’s topography and landscape, and your budget. If you want a large deck for entertaining, but there is a beautiful tree in the way that you don’t want to lose, we can design a deck around that tree. Your choice of deck materials will be guided by your color and style preferences as well as your budget. For example, if you want to avoid the on-going maintenance of a wooden deck but fear the expense of a composite deck, we can show you the different composite decking price ranges and help you compare. Once you select your deck material, we will guide you through the selection of your railing design and material, stair design options, and deck amenities. Even if you have selected wood for your decking material, you have the option of using a low-maintenance material for your deck railing, which will decrease your deck’s maintenance needs. Low-maintenance railings include iron, aluminum, vinyl, composites and pressure-treated pine with composite caps. Baluster or picket materials include iron, aluminum, vinyl, cable and…glass. Yes, glass! Deck amenities include lighting, pergolas, privacy screens, built-in benches for storage and seating, under-deck drainage systems, and even outdoor kitchens. If you have children, grandchildren or pets, you may want to include a gate at the top of your deck stairs for safety. When it comes to amenities, the only thing holding you back will be your budget! What Porch Design Decisions Will You Make? As your custom porch builder, Archadeck will guide you through all of the necessary porch design decisions. Porch size and shape considerations are similar to those affecting the size and shape of a deck, such as how you plan to use the porch, your yard’s topography and landscape, and your budget. One important consideration is how the roof of your new porch will tie into the existing roof of your home. We can help explain what is possible and what is not and suggest alternatives as needed. Decisions for your porch ceiling style offer room for creativity. Will you choose beadboard, painted ceiling, open rafters, or knotty pine? There are so many choices. Depending on your roofline, you may also have the option of a vaulted or cathedral ceiling. For the porch floor, decking boards and tile are two popular options, but if you have young children crawling about, you may prefer an indoor/outdoor carpet. For screened porches, there are different types of screen to consider. Privacy screens block the view from outside; solar screens lower heat transfer from the outdoors into the porch, while still allowing a nice breeze; and pet and child-proof screens are more durable than others and will resist tears. Depending on the height of your screened porch, you may have to add a railing or knee wall, either inside or outside of the screen. Most railing options available for decks will also be available for your screened porch. Are you interested in a screened porch with windows? The Eze Breeze window and screen system is a perfect solution. Vinyl Eze Breeze windows can be closed when you want to keep out pollen or the chill and opened to reveal screens when you want fresh air and breezes. You can even remove the windows entirely during seasons when you won’t need to close them. The windows are ultra-clear vinyl and offer a clear view of the outdoors. Finally, lighting and ceiling fans are popular porch amenities, but there are countless other options to consider as well, including skylights, a fireplace, or a wet bar. These decisions go back to the original question: how would you like to use your porch? With so many design considerations, there are endless combinations for creating a truly custom outdoor space for every client. As your custom builder in the greater Triangle, Archadeck of Raleigh-Durham can design and build the project that is just right for you. Call us today to schedule a design consultation: 919-973-1523. We look forward to working with you! Did you like what you read here? Join our newsletter list here to get an outdoor living update straight to your inbox four times a year. We promise not to spam! Click Me!